I just had confirmation that my BreakUp Candle worked!! I'm so pleased!! Congratulations on your success! Did you burn a 7-day candle? A divorce candle? Or what? Share! Congrats!! So what was your process!! Yes I did a 7 Day Breakup/ Divorce Candle-- and it was about 6 weeks ago, and I COMPLETELY forgot about it.. I did it for 2 reasons, one is this man doesn't have any business being married-- and secondly I had dated him while he was engaged to this poor girl (unbeknownst to me) and I guess I was just getting even or something.. I did alot of Internet searching to find out he was getting married to another girl, and I'm still fascinated with what's going on with him-- can't help it.. Anyway I did the Breakup Candle on a whim awhile ago and today I looked up his Name in the Whitepages and his listing with the wife is gone! It's just her now, AND, he's got himself a new online profile up.. I'm just so thrilled to see things work!! Strangely I just realised I've been getting hangups from a new number in the area code he lives.. could he be that dumb?? Congrats! This is a good example of when someone stops getting hung up on when the results are going to happen. When you forget, or at least trust that its going to work it does. Well Im glad to see you got results, and may you have many more successful spells. I realising that that is the key I believe..you need to perform the work and then really forget about it.. if you obsess it doesn't work for some reason..
share! how you did it? Well I'm still trying to figure it out, but the key seems to be not obsessing over results. This particular situation had been going on a long time and I think i was less invested in seeing an outcome -- if I had done this 6 months ago when my emotions were high I don't think it would have worked. Which is disappointing in a way because when you really want it to work is when you perform the work, so there's a bit of a Catch 22 there .. I think you have mastered a key skill that not many people do not master. Obesessing over a spell, and constantly thinking and worrying does not help the spell. I think you will see more successes in the future. Did you perform the 7 day breakup spell kit from luckymojo. I'm also thinking of doing that but am a little worried about disposing the remains as none of the options provided seem feasible. How did you dispose the remains? Pls guide I'm very desperate to perfom this spell asap. When you buy the candle from lucky mojo, you can buy the candle fixed with herbs and oils. Yes some people do not use any herbs or oils, but herbs and oils give the extra power. Each herbs has its own set of characteristics/personality the herbs and oil help add and direct towards the goal. The are several ways to break up a relationship but as for breaking up marriages this can come back to haunt you. As long as there is justification one would think that you should be o.k. but I suggest in using wisdom! Nevertheless congrats! I am having LM burn the candle for me, and have had them burn others relating to this issue with somewhat optimistic results.. I've noticed with my own spells that it's a delicate balance putting plenty of emotion in to the spell and then walking away from it and trying to be indifferent and just accept the results. But it definitely seems to be the best way! I've had much more success when I have achieved this "balance." No, it's not easy...but like anything else, with practice, it can be done. I had the church do my break up fixed glass encased candle and the two I want to break up will eventually break up, but it will take some time. I wonder how long cause I have a feeling that things will be rushed come this August. Yeah I really don't want that. Do another one...I read somewhere that it would more likely then not take more then one candle of any kind for something like that. I need a fast easy 7 day breakup spell too, can you tell me how you did this? I have tried and seen very minimal results with mine. ok so i usually burn 3 glass breakup candles in a triangle but they seem to not have worked like they did before...i was told that my exs bf put a block on me and my ex to have feelings for one another and im sure that could be why they havent worked and someone suggested burning 7 glass candles together in a circle because it would be stronger, well i started that yesterday, and today all the wax in the glass seems to have turned liquid and it could just be because i am burning them in a bbq pit discreetly outside on my patio because i was told you should burn these type outdoors and never inside...would it be better if i get 7 of the small freestanding black alter looking candles that last only 2 or 3 hours dress them and let them burn in a circle? one of the glasses already broke because the wick was too close to the jar. Yes the wax is going to turn to liquid, especially if the glass candle has been left on for a while. If there is a block on you...you need to do a road opener, or as we have discussed you need to do some unjinxing to remove the spell that is on you. It does not matter if you uses glass candles or the free standing ones. I am not sure that question was more about the candles burning in less time. If you use small candles that take like 3 hours to burn, it would have the same effect as a candle you burned for 10 hours. That is if you put the same amount of energy in each candle. Personally, I do not let me candles burn down all in one sitting, or in one day if thats possible. I like to spend at least 3 days doing a spell because by me reciting it over and over again for those next 3 days, its like doing the spell 3 times, and adds power to the spell. Basically, do what works for you? Some of these questions are relative to the person who is doing the work, and it is your personal preference. so little 6 inch candles do you let yours burn about 10 min a day then put it out with a snuffer? just curious..i know some people say dont burn out 6 inch candles but some people do as you do and let it burn little at a time. Are these Lucky Mojo candles? Well, if they are lucky mojo candles they should already be dressed unless you request them to not be dressed. As for what spells, it should have a prayer located on the vigil candle. You can search the forum for break up spells, and specific ingredients. We have talked about this many times before, and I am sure there are some good spells discussed here. wow thats really encouraging suzyparker, thankyou for sharing that with me. Lucky Mojo dresses the candles with herbs and oils before shipping them to you. They should already have what is needed to set the light, as is. The addition of herbs or oils is unnecessary. Shelly, again this is just my opinion... if I wanted him I would do a love me fixed candle, yes they are fixed perfectly, but adding herbs and extra oils cannot hurt (even if it makes you feel like you're doing something), add some Compelling Oil and I wouldn't bother with a breakup spell, period. I know a lot of people will tell you to break them up first before you do a love me to get the other person out of the picture, etc. but think about it.. if you do a love me and he loves you.. he will leave her anyway.. I've had more success focusing on what I want him to do with ME versus what I want to happen two other people..
No thats fine, Im new to this so I am open to any suggestions, I was going to do a honey jar for him and then a reuniting ritual. I was wondering whether to do a follow me boy candle before or after this? If the follow me boy candle is effective as you say I will do it because this is the outcome that I want. A honey jar will make him sweet for you.. you should add his hair and yours to it and some love herbs or cinnnamon to make it more "hot" and passionate and then you burn candles on Monday, Wednesday and Friday. Pick an amount of time and only do it for that long and don't obsess about the spell.. Just know it will work and it will. I used to have a hard time letting it go, but someone on the board suggested that the more you worry you mess up your energy and that's the truth. Follow Me Boy fixed candles work wonders... just let it burn straight through in a safe place or extinguish after 15 minutes each day until it's gone.. Follow Me Boy gets that puppy love thing going strong. Ok I ordered a Break-Up Glass Encased Candle<<Fixed, but I am now really confused what this is fixed with. I never sent my request on who I want to break up, so does FIXED mean something else? I was really hoping the candle would have had some instructions, but I believe it would be appropriate to write the undesired couples names with a broken heart on it, unless someone suggests something else? Fixed means its dressed with oils,herbs, and somethings glitter(yay glitter!) and prayed over. You still have to write the petition and utilize personal concerns, if you want to write the undesired couples names with a broken heart on it, go for it. Or did you have this burnt at Missionary Independent Spiritual Church, in which case you were supposed to provide the couples names and you petition when you ordered it. I guess I should have! So what do you recommed doing with this candle? Well since you are doing it just do what you originally planned it's perfect timing the moon is in waning there is a saturday coming up ( good day for breaking up relationships) I think your doing fine. Give it a go! I have a question how powerful is a break up candle? and have anyone on here had use it for someone to break up a couple if a person felt that another person should not be with them. Do you mean the glass encased vigil light or the figural candle with the couple back to back and the wick down the middle? Anyway questions like this don't really tell you a lot if you think about it, if I have stunning success with a single candle it doesn't mean you will, and if I fail miserably the same holds true. It depends on the situation, each one is different, the skill of the worker and of course where or not it is meant to be. So yes I have broken couple up with just a candle, they were not a good couple to begin with. That do not and should not mean anything to you or anyone else, as I said every case is different. 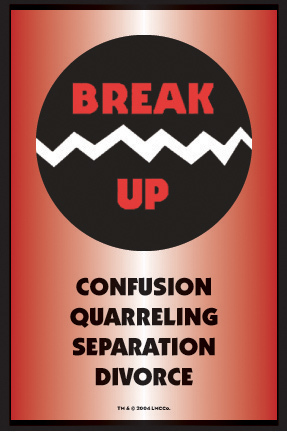 If you want to break up a couple then you might want to buy the Break Up spellkit. I meant by the glass encased vigil light for break up and is it sucessful. As I said in my original post, that question doesn't really tell you anything when it is answered. If it works for me in one case it might not work as well or in the same way or at all in another, the same gos for any sort of spell work. Yes they can be helpful, but chances are you are going to have to do several of those or other spells to get a couple to break up especially if they have been together for a while. I am in agreement with HD & Stars- your best bet is probably the Break Up kit. It will contain everything you need. You can back it up with a Break Up vigil candle (glass encased), either lit by you or on your behalf by the church. Break Up work is very popular, but not necessarily easy. A lot depends on the strength of the couple and on your skill. Chances are that you will have to work from several different angles and over time to get your results. I have a question about the candle included with the break up kit. Now, the candle doesn't look like the one I saw on the break up page. The candle I have is black but the couple is standing "beside" each other as opposed to having their backs to one another. Also, It has 2 wicks for lighting. What route would I need to take in dressing the candle and carving the names on this candle since the couple is standing beside each other? You should call the shop, because you might have been shipped the wrong candle. The picture of the Break Up kit shows a black bride and groom candle. I know, that's why its weird the kit shows a black couple candle. Hmm, its a mystery lol. would a break up work if you have the person's full name and birthday and does that mean that he target actually had been hit. I remember in the past that I had some candle work done for me through LM setting lights and it has been a hit on target? what does that mean and has that ever happend to any of you all when you had work done or did it yourself? When I did the kit I received the same candles. I figured that they were black and pretty much meant the same thing to end a relationship, so I didn't worry about it. I also have done the glass candle too. Yeah you will be doing these for a good while. I have done quite a bit of them myself, but it's starting to pay off. I add a separation candle to the equation because when people break up they could possibly get back together again, so I added separation when something is out of sight it's out of mind. When you combine it with the break up, it makes it stronger and possibly a more permanent situation. I wrote the names on the backside of the candle. As for the dressing of the candle I started center and rubbed the oil towards the top all the way around then I went back to the center and rubbed the oil towards the bottom. okay maybe this question may have been answered or not. Would a break up vigil set by LM be a last minute option even though a person has tried everything to break up a couple? Just curious and has this ever happen to anyone before in other words you have tried everything, yet they are still together would that be a final option and has anyone tried them and became successful and have they had any kind of draw back or negativity that came after and have you protected yourselves when LM do the work for you. Any thoughts? I also like to add is that I have read on certain forums that the month of September that we are in right now to do any kind of work including break up my question is would Saturday be a good day to have LM set lights around that time? If you are gifted for this work, and have worked on a couple and they have not broken up, have you considered that you are not meant to? You do not get to break up a couple just because you want to, it depends on whether or not you are meant to do it,and whether or not they are meant to break up at all. Do a divination before you start any work. Anyways, if you have worked on them, and you are able to do this work and they have not broken up I do not think a vigil is going to do it. I am starting a break up vigil candle but need to know if I do a cleansing bath AFTER the candle is done burning? And also I cannot leave the candle burning continuously so is it okay to pinch out the flame and re light on Tues Thursday Saturdays? Or do I light every day? as far as i am aware.. u always need to cleanse yourself..before or after... but in ur case you can do it after. also as its a vigil candle its more effective to burn this type of candle over 9 consecutive days or however long until it burns out. you can burn it for 15minutes at a time. I agree with MaJiG_GarDen. Make sure that when the candle is light that you spend that time concentrating because I had a friend that would light it and then walk away and expect it to work. In my opinion, vigil candles are really intended to burn continuously. Other types of candle spells involve snuffing and re-lighting, but vigils are designed to burn continuously to do their work. There has been at least one thread here talking about ways that you can safely leave a vigil light burning continuously - putting into the oven is one way, or leaving it in a deep sink are two easy ways. If for some reason you absolutely cannot leave a vigil light to burn, then I would personally suggest that you look at some other kind of break-up work that you could do periodically when you are at home, like a vinegar jar or something. Have you made a petition paper or anything to burn under the candle to personalize it to your specific needs? As Tabby mentioned, just lighting a candle is not going to do too much. I assume that you've bought a fixed candle from LM, so at least that part of it has been done for you, but you need to personalize the work and invest your time and energy in doing the work in order to get results. How do you use the glass encased break up vigil candle? I know you burn it over 7 consecutive days and write a petition adding break up oil destruction oil, but is there anything else I should do? Could I add some war water?